There will also be a serial number accompanying the maker stamp. If there is ANY stamp other than the above on it, then it’s not one of mine. We’ve been making saddles and tack for working Montana Ranchers and Cowboys for over 30 years.Coupled with a lifetime of using horses for both work and pleasure, this combined experience allows us to craft a saddle that will please the customer in all ways. We use only the finest materials available-USA tanned skirting, real sheepskin, and the finest rawhide covered trees available. 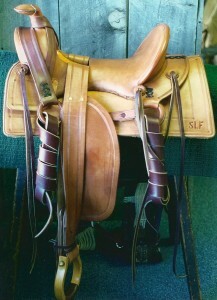 Your pride in owning a finely crafted custom saddle is surpassed only by our pride in creating it for you. 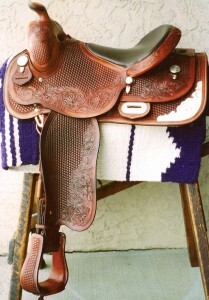 Buying a custom saddle can be a major decision-if you have questions or concerns, don’t hesitate to call or email us. or even your own unique logo or picture. Reproduction of a 1900’s era Miles City Saddle-Extra Fine Flower Tooled -Truly a work of art that will appreciate over the years. 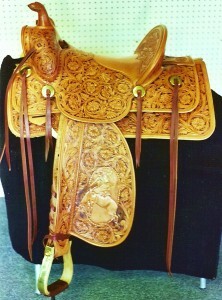 All of our designs are our own hand drawn originals, making each saddle unique, not a copy of some other saddle. 58 Wade Buckaroo Style Saddle, Post Horn, Border Basket Stamped, Taps, flat plate rigging- custom made to your specifications. Features combination flower/basketweave tooling, inlayed padded seat and sterling silver trim. 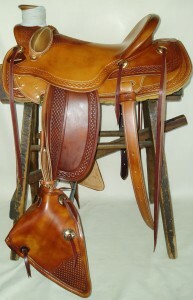 Reproduction Circa 1870 Texas Trail Saddle Features Sam Stag rigging and 3/4 seat, Apple horn. 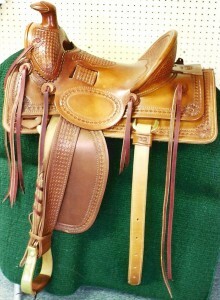 We can reproduce saddles and gear from any era. 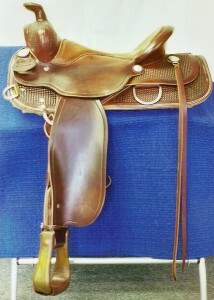 Reproduction Miles City Saddle-Circa 1900Features loop seat in 8 button style; shovel cantle-just like the original. Accurate in every detail-we even use the same techniques when making a saddle as was used back then. 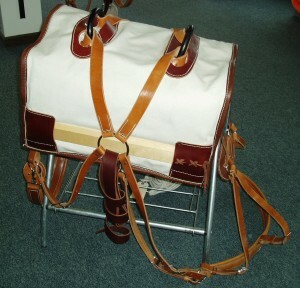 DECKER PACK SADDLE- We make and sell a complete line of equipment for the Packer: DECKER & SAWBUCK PACK SADDLES, PANNIERS, SCABBARDS, SADDLEBAGS, HOBBLES, PADS along with rope, scales, feedbags and all the other items the horse camper needs.Our Decker pack saddle is the finest decker available-Heavy Harness leather rigging, #4 duck halfbreed stuffed with “rubberized hair” and rolled britchen & breast collar per Forrest Service specs. Available in horse or mule trees. We also make sawbuck packsaddles in a variety of tree configurations – call or email us with your needs and questions.